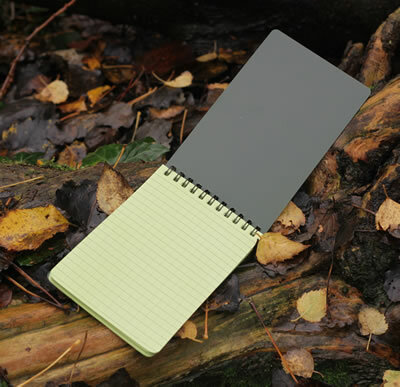 When you first think about the all weather waterproof notebook you may just focus on the ability to write things down in the rain, yet the all weather waterproof notebook has a lot more going for it than that. Let’s start with the obvious then progress to how this piece of kit may even save your life. As you might expect from an item called the all weather waterproof notebook, the pages of this notebook have been created and treated in a way that stops water from initially soaking into the fibres. For example, if you were to open up the all weather waterproof notebook in the rain the rain drops would rest on top of the paper and not absorb. To remove any water drops you can wipe the paper clean or just give it a little shake. After prolonged exposure to water (including submersion) the paper will slowly take on water. However, this is where the all weather waterproof notebook really comes into its own. When the pages are wet they do not stick to each other, writing will not ‘bleed’ and you can actually still write on the paper in this condition without it tearing. Even when paper has been extensively wet through it doesn’t take long for it to dry out once no longer being exposed to the water source. When dry the paper in the all weather waterproof notebook returns to normal useable paper. Ball-point pens and pencils are the recommended writing implements for use with the all weather waterproof notebook; although other pens can be used the functionalities already mentioned cannot be guaranteed. The size of the notebook is 16cm x 10 cm x 6mm and it contains 50 sheet of paper / 100 pages. This size makes it a perfect pocket sized notebook, ready to jot down ideas without having to search through your bag trying to find it. Each page is horizontally lined with vertical dashed lines making an accurate grid that can be used to make scaled maps and accurate drawings if required. 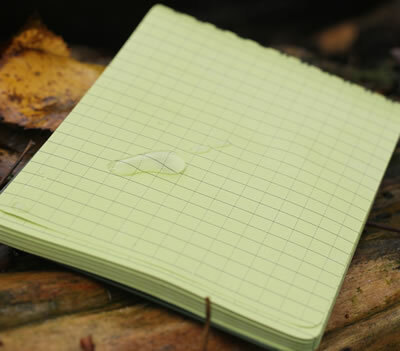 With survival in mind, you couldn’t find a better notebook than the all weather waterproof notebook. The bright green pages can be written on and left in strategic places allowing a search party to find you with ease. Another survival feature is that the pages can be dried out using just your body heat, once dried out this paper can be used as tinder to start a fire. If you had fallen into water and the pad was wet you could be drying yourself by a fire in no-time. But survival isn’t just what this notebook is good for, it’s also great for the accidental moments that befell us all. The water canteen spillage, the rucksack left in a puddle, drink spillage, the list goes on. The all weather waterproof notebook is also great for other activities. The ability to write on the paper can make this a very useful tool for scuba divers or those working with water. Another activity that lends itself to the use of this notebook is geocaching as it makes a perfect log book. Compared to a standard notebook you are only paying a tiny bit more but getting so many amazing qualities. Who’d have thought such a simple piece of kit could do so much? 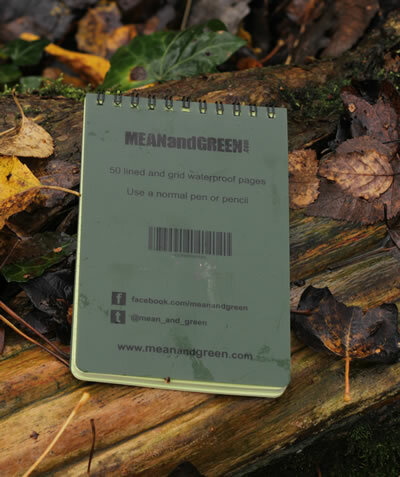 You can buy the All Weather Waterproof Notebook directly from this site.